Researchers: R. G Smith, R. Knight, J. Chen, J. A. Reeves and H. A. Zebker at Stanford University and T. Farr and Z. Liu at the Jet Propulsion Laboratory, California Institute of Technology. Groundwater withdrawal during the 2007 to 2010 drought in the San Joaquin Valley in California caused a great deal of subsidence. The subsidence was measured from geodetic data. These measurements were used with water level and geologic data to determine the amount of inelastic deformation. 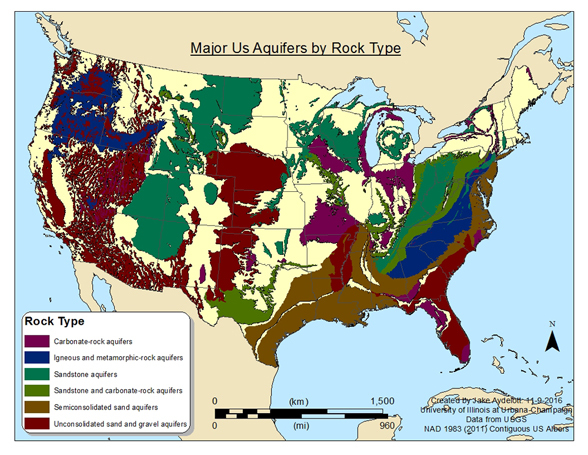 The results suggest that the majority of the deformation was inelastic during the drought and thus the volume of the aquifer has been reduced, leaving less storage capacity for water in the future. The San Joaquin Valley is part of a major agricultural region in California’s Central Valley. Much of the irrigation for water-intensive crops in this arid climate comes from groundwater extraction. The recent droughts have increased the groundwater extraction, leading to more subsidence. Of some concern is whether the extraction is causing permanent compaction and the loss of groundwater storage capacity. Inelastic deformation is the amount of compaction and reduction in the volume of the solid material within and around the aquifer that will not re-expand during recharge. Measurements of extraction and subsidence were gathered from water level data, estimated geomechanical properties of local sediments and geodetic data for the San Joaquin Valley during the 2007-2010 drought. The geodetic data were primarily Interferometric Synthetic Aperture Radar (InSAR) observations of subsidence. The InSAR data are calibrated to the Plate Boundary Observatory GPS sites to get precise positioning. The maximum amount of vertical subsidence determined from InSAR during the drought in the southern San Joaquin Valley was about 85 centimeters. Combining all of the data suggests that about 5 to 9 percent of the volume of groundwater used during the drought was permanently lost for future groundwater storage due to inelastic deformation. This may seem like a small percentage, but it can add up over time. Using InSAR for estimating inelastic deformation has many advantages. Two key advantages are that the method does not require a detailed groundwater model or a detailed history of the well head levels, when used with geomechanical data. Smith, R. G., R. Knight, J. Chen, J. A. Reeves, H. A. Zebker, T. Farr, and Z. Liu (2017), Estimating the permanent loss of groundwater storage in the southern San Joaquin Valley, California, Water Resour. Res., 53, 2133–2148, doi:10.1002/2016WR019861.